I love rock climbing. I learned how to climb in my late 40s. 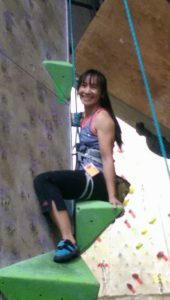 You can find me at least 2 to 3 times a week at a rock climbing gym in Orlando, Fl. It keeps my body challenged physically and my brain engaged. It is a great alternative way to work out while having fun. Climb with me. I would love to meet you there. Rock Climbing Belay Gloves​ – Which One to Choose From? Fingerless Climbing Gloves – Are they worth while?